Listening to digital music is usually a pretty solitary experience. 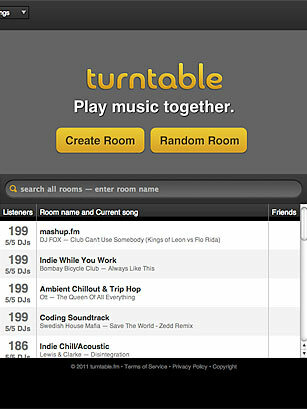 Turntable.fm, however, is joyously social. You enter themed chat rooms (containing either your friends or strangers) and take turns deejaying songs from your own collection or Turntable's library. Everybody chats and votes on the tunes; the interface, with tiny cartoon characters representing the participants, is part of the fun. This new site is already a productivity-crushing phenomenon in Silicon Valley; it isn't officially open to the public yet, but you can get in if you have a Facebook friend who's already a member. See the top 10 musical collaborations.